Go to original pattern for design DROPS 179-17. 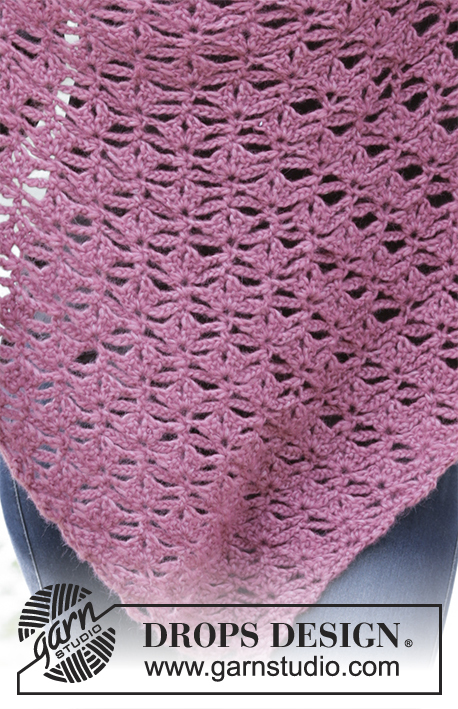 Shawl with fan pattern, worked from tip and up. 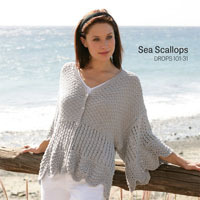 Piece is crocheted in DROPS Air. 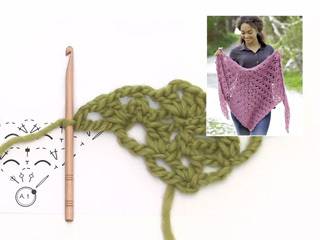 DROPS CROCHET HOOK SIZE 6 mm – or size needed to get 12 treble crochets = width 10 cm. 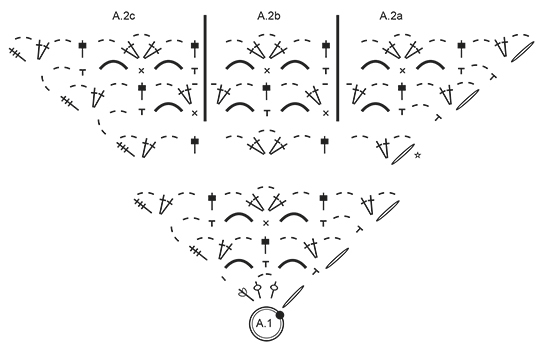 Pattern A.2b measures approx. 6.5 cm in width. The shawl is worked back and forth from tip and up. 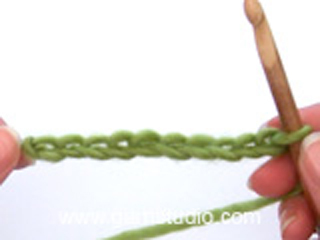 Begin with hook size 6 mm and Air and work pattern according to diagram A.1. Work last row from right side. Then work as follows from the wrong side: Work A.2c, A.2b, and finish with A.2a. When A.2 has been worked vertically, repeat A.2 as follows: Work A.2c, A.2b 3 times in total in width, and finish with A.2a. Repeat A.2, every time A.2 has been worked vertically 1 time, work A.2b 2 times more in width. REMEMBER THE CROCHET TENSION! When piece measures approx. 60 cm in the middle of shawl, fasten off. Please elaborate "Repeat A.2, every time A.2 has been worked vertically 1 time, work A.2b 2 times more in width. " I tried many times but cannot seem to get it right. tks/Drops follower from Malaysia. 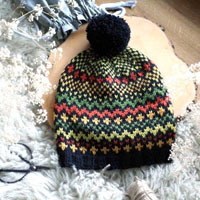 Dear HK Lum, it meanst that you have to knit the rows of pattern A.2 above each other. 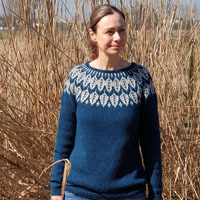 And after every time you finished one repeat (for rows) you have to crochet one more repeats (for stitches, i.e horizontally). I hope this helped. Happy crochet! I love your crochet patterns! They are the best! 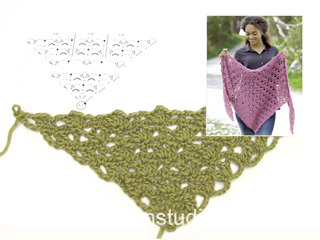 Sadly, I can't follow the crochet pattern diagrams. In USA patterns we get written step by step instructions. That works well for me! 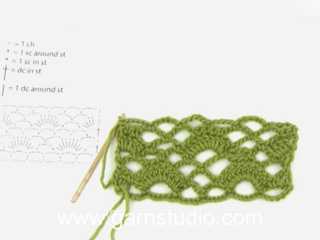 Is there any way you can provide me with written step by step instructions for your crochet patterns? Thank you! Dear Mrs Hsia, this pattern has only diagram: each symbol match a stitch/group of stitch, start working A.1 from the bottom (= ring of chains, black dot) and work row 1 (and all odd numbered rows) from the right towards the left and row 2 (and all even numberred rows) from the left towards the right. Happy crocheting!